When John Aubrey made his plan of Avebury in 1663 he drew the West Kennet Avenue as being virtually complete - it is unfortunate that he failed to notice the Beckhampton Avenue to the west of Avebury, so we have no idea how much of it still existed then. By the time William Stukeley arrived in the 1720s the Beckhampton Avenue was in a ruinous state and its remaining stones were still being removed as building material. Stukeley made several sketches in the field that are undoubtedly more accurate than his later published engravings. An excellent observer, Stukeley recorded many useful details of the Avebury landscape sometimes accidentally, whilst focussing on what he regarded as more important features. Stukeley later 'modified' his recording of both avenues to better fit his pet theory: he claimed that Avebury and the two avenues represented the Egyptian symbol of a winged serpent (without the wings). In attempting to make the two avenues appear more symmetrical he distorted the landscape and drew the circular Sanctuary as an oval so it appeared more like a snake's head. This obvious deception sullied Stukeley's reputation and for centuries after he was regarded as an unreliable witness. Many archaeologists regarded the Beckhampton Avenue as pure fantasy until 1999, when the Longstones Project led by Mark Gillings and Josh Pollard excavated some of the avenue's buried stones, confirming that it had indeed existed. Although this exonerated Stukeley for his wider claim, some aspects of his work are still viewed with suspicion. Stukeley's published plan (above) shows the Beckhampton Avenue continuing south-west beyond the Longstones to south of the Bath road (A4) and ending at Fox Covert, near a patch of scrub and woodland where there is a small group of round barrows. The archaeologists of the Longstones Project were unable to find any traces of the avenue beyond the Longstones and concluded that it must have terminated there. This is still disputed by some, who insist that Stukeley was correct. Stukeley's field sketches, however, reveal that there was scant evidence, if any, for an avenue running to Fox Covert, even in 1724. Below: Fox Covert, pictured looking south from the A4 road. 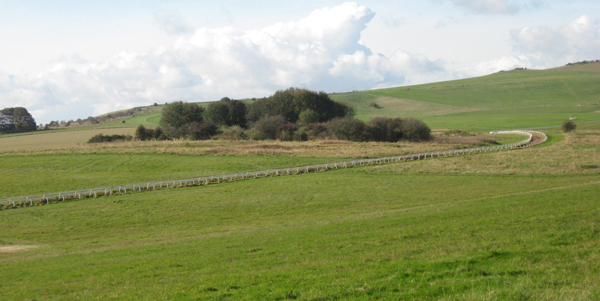 Popular with dog walkers, this large expanse of open land is used as racehorse gallops. Although privately owned, the public are allowed access every day after noon, when training has finished. Hidden behind the trees is the group of round barrows where Stukeley claimed that the avenue terminated. In the archive of Avebury's Alexander Keiller Museum are some large photographic copies of Stukeley drawings once owned by Keiller. One is a large L-shaped panorama of Avebury, showing both avenues, that was likely drawn in the field in 1724 (below). Stukeley depicted all existing stones realistically, as standing erect and casting shadows. Hollows where stones had been recently removed were shown as black rectangles. His estimated positions of missing stones were indicated with small, round dots. Stukeley showed the Beckhampton Avenue with just the two Longstones standing. From the river Kennet to the Longstones, two thirds of his stone positions were estimated and marked as small dots, with a third shown as rectangles. The last section, from the Longstones to Fox Covert, was almost entirely estimated, with only seven stone positions shown as rectangles and almost a hundred as dots. At the far western end of the avenue Stukeley drew a double-concentric stone circle labelled: "The Temple of [.......]". The rest is unclear, as Stukeley later crossed it out , but it may likely have been "The Temple of the Pythian apollo". Stukeley was claiming there was a section of avenue almost a mile long, running from the Longstones to a stone circle at Fox Covert. None of its stones were standing, with scarcely any indications that they were ever there. There certainly was never a stone circle at Fox Covert and even Stukeley came to realise he had gone too far in adding one, since he later crossed out its title. The lack of symmetry between the two avenues is why Stukeley distorted the facts. To further his new career in the church, he wanted the overall shape of Avebury to be a 'Druidic' representation of the Egyptian globe and winged serpent symbol, which was symmetrical with one head at each side. This was the reason for adding an imaginary stone circle at Fox Covert - it was another serpent head, to match the one at the Sanctuary. The winged serpent also lacked wings. Stukeley brushed this off, explaining that the wings would be too difficult to execute in stone. 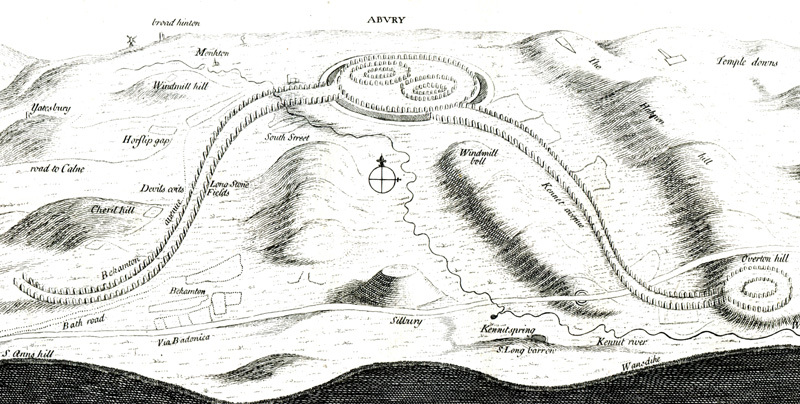 When Stukeley's plan of Avebury and its avenues was finally published in 1743 it was significantly different to the sketches he had made in the field some twenty years earlier. His invented western stone circle was abandoned - the avenue now terminated at Fox Covert as the tail of the great serpent. Stukeley used his considerable skill as a draftsman to subtly distort many features of the map, masking the distortion as foreshortening. The stone circle of the Sanctuary, for instance, became an oval that more resembled a serpent's head. Avebury's two avenues now appeared perfectly symmetrical: they were the same length because Stukeley had stretched and manipulated the landscape they spanned. If Stukeley's depiction of the Beckhampton Avenue is transposed to a real map, which is not easy, the distortion becomes truly apparent: he has made the avenue appear almost twice the length it should be. Below: Stukeley's 1724 panorama of Fox Covert c/o The Keiller Museum, Avebury. Click image for larger version. Whatever prompted Stukeley to conjure up a winged serpent? Page 104 - Where Did the Stones Come From? "Before the mid 19th century sarsen deposits extended far beyond the remnant areas protected now. Stones filled the valley from Lockeridge to beyond Boreham Wood. From Piggledene they stretched up to Overton Down. They lay along Clatford Bottom and at Stanley Wood. In 1644 Symond's 'Diary of the Marches of the Royal Army' records that "stones lie so thick as you may go upon them all the way." "The sarsen stones at Avebury and Stonehenge originated from the same place, the Marlborough Downs located just a few kilometres to the east of Avebury, where countless sandstones megaliths were left behind after the last continental glaciation." John Aubrey, in 1648, recalled that his hunting companions, "met at the Grey-Wethers. These Downes look as if they were sowen with great Stones, very thick." William Stukeley wrote in 1743: "On the direct Bath-road from London. Passing from Marlborough hither, 'tis the common topic of amusement for travellers, to observe the gray wethers on Marlborough downs, which are the same kind of stones as this of our antiquity, lying dispers'd, on the surface of the ground, as nature originally laid them. When we come to this village, we see the largest of those stones in great numbers, set upright in the earth, in circles, in parallel lines and other figures..."
"The origin of the stones in the Avebury stone circles is often considered to derive from one of the accumulations that still exist on Overton or Fyfield Downs to the east of the site, each stone being dragged a distance of several kilometres up and over Hackpen Hill. Such suggestions are merely a response to where boulders can be found in abundance today. However, as noted above stone was certainly available locally and may have been present on the site itself. There is no reason for the stones to have been hauled such a distance. Local accumulations of sarsen are or were certainly present here and it is likely that the valleys were once covered with boulders even though only isolated examples now survive. The farmer of land east of the West Kennet Avenue confirmed that a ridge c1.0m high and 30m wide `consists of a seam of sarsen that runs through the field' (Barker 1985, 21). Thus the land for this massive construction would need to be cleared first and any boulders within the immediate vicinity removed. Given this scenario the stones for the circle may well have come from the immediate vicinity of the henge, some potentially from the interior."